Is there a more joyous time to the year? Light evenings, a bit of sunshine and the prospect of a few Bank Holidays to look forward to! Did you know that we have a national celebration for our wine industry too? Make sure you’re well stocked for English Wine Week at the end of May into June and don’t forget we’ve got lots of different English wines available in our shops and on our website. We’ve also included the odd parcel or two of ‘once they’re gone they’re gone’ wines like the Sablet and Boroli Barolo. There are some other brilliant wines in here as well as details of three upcoming tutored tastings so if you’re keen to experience the stories behind wine, why not book a ticket or two? Cheers! We at Hennings are never afraid of looking to the future and discovering new and exciting things. In this case, if I may use the phrase of a recently merged telecoms giant, ‘…the future’s orange’! Yes, the future is here and it’s orange wines. For those that have heard of this stuff before, you’ll know that its usual home is in the trendiest of trendy London hipster joints, with a beard and several tattoos being a pre-requisite to entry. However and to the tune of many a chuckle it is becoming increasingly more main-stream. So for those of you that haven’t heard of them before orange wines are essentially white wines made in a way that you would a red wine – basically keeping the skins in contact with the wine for varying periods of time. The resulting wine has a much more intense nose and palate with much more texture, even tangible tannins in some cases, and the colour of the wine (that comes primarily from the skins in every wine) develops an orange colour. The colour depends on how long the wine has spent in contact with the skins, and in the case of the two we have decided on, ranging from a golden hue to vivid orange. Now, I’m not going to lie to you there are some truly breathtakingly awful examples out there and we tasted a couple of heinous ones very recently including one that tasted like Deep Heat! The sarcastic undertones of the often heard words ‘you have a tough job’ never rang truer than in this particular tasting. As we soldiered on we came across two that we thought were actually really very good, but in very different ways. Our first choice is a Pinot Grigio, but this is no ordinary Pinot Grigio and I suggest that if you were after a Pinot Grigio in the first place you’ll be more confused than a chameleon in a bag of Skittles when you uncork it. This hails from Abruzzo in Italy and is essentially a ‘beginners’ orange wine whereby it has been left on the skins for just enough time to develop a bit of texture and a bit of colour along with some intensity on the nose and palate. Chill this down, pair it with some light food, perhaps some spicy food and you are on to a winner! It will certainly generate conversation around your dining table! The next offering is from Austria and is made from a grape called Roter Veltliner, an obscure ancient variety that usually makes powerfully intense white wines. The vivid orange colour should not fool you, this is not a sweet wine. It is intense, peppery and spicy. Those of you brave enough to try it will be confused no doubt, as it is unlike any wine you will have tasted before and as such cannot be directly compared to any other. It is fruity and powerful with a nice level of acidity and soft tannins. The fact it looks so whacky in the glass should be considered an added bonus. Jokes aside it is however great for matching with richer dishes as it can stand up to most things without the need to resort to a bottle of red. When a white or red could work I would urge you to go straight down the middle with an orange wine instead. Wine can be incredibly varied and interesting and I think it’s worth celebrating that people are pushing the boundaries in order for us to try something new. Yes, you may get some odd looks from those you’re serving it to, but I think that’s part of the fun! You may also think it’s awful but I’ll let you decide for yourselves. It was light last night when I left work – let joy be unconfined. This issue of The Grapevine is almost finished too, once this bit has been typed, so it’s time for a double celebration. We’ve worked tirelessly on this issue and couldn’t be happier with the result. The thousands (yes really) of wines the team have tasted over the last few months have been distilled down to a seemingly small number and a selection of them can be found within these pages. The rest will make their way into our shops over the next few months so everyone has something new and exciting to explore. The tastings haven’t always been easy (see pages 18 and 19) but they’ve always been fun. There are some brilliant wines in here as well as details of three upcoming tutored tastings so if you’re keen to experience the stories behind wine, why not book a ticket or two? Cheers! We’ve had a bit of a fag-packet wine tasting calculation in the office and reckon we’ll taste around 2,500-3,000 wines between us by the end of February. The first couple of months of the New Year are always a mixed bag for us. Following the Christmas chaos, organised chaos I’d like to add, January inevitably feels a little sluggish. There is a flip side to the calm start to the year. 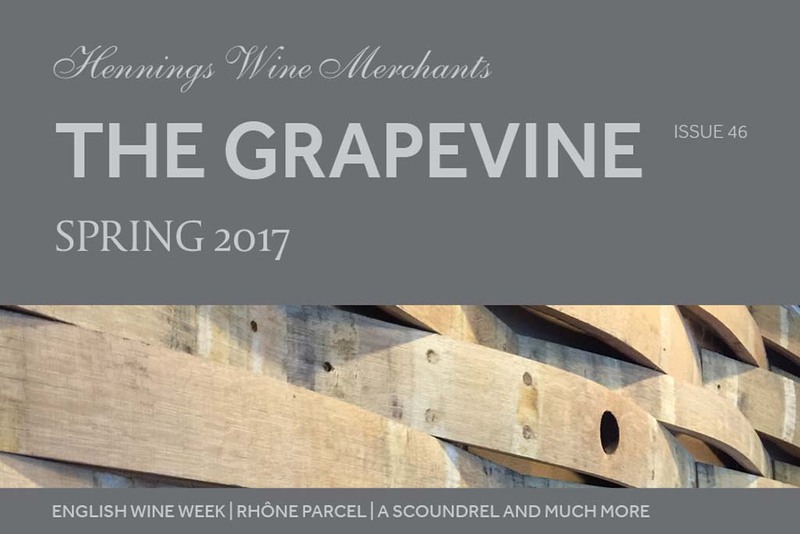 As well as having some time to plan our exciting wine tasting events for the year, a little bit of design work (new bags, banners and the like) and having a general website content catch up, I find myself in the gloriously manic wine tasting season. This season comes around every year and lasts from mid-January to mid-March. 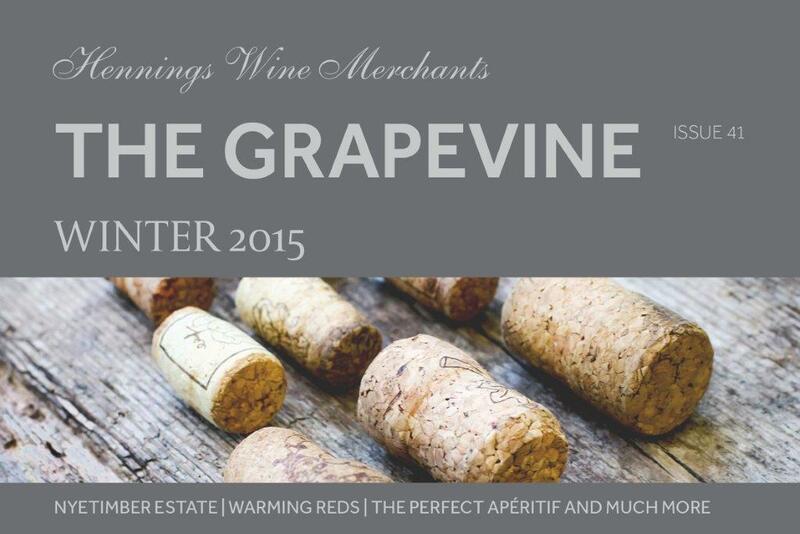 Of course, we taste wines all year round but these early months are when we cull and refresh our range the most. We’ll taste anything – low-alcohol wines from Australia? Yep and no thanks; sparkling wine from Spain with a Sherry dosage? Let’s go for it; £5 Italian Sauvignon Blanc to £100 Chilean Cabernet Sauvignon? Everything has equal billing and I’m always delighted to be surprised so why not. We have a few of options when it comes to tasting new wares. First, there are the agent and ‘body’ events. The agent/importer tastings tend to take place in London and will feature their entire range. 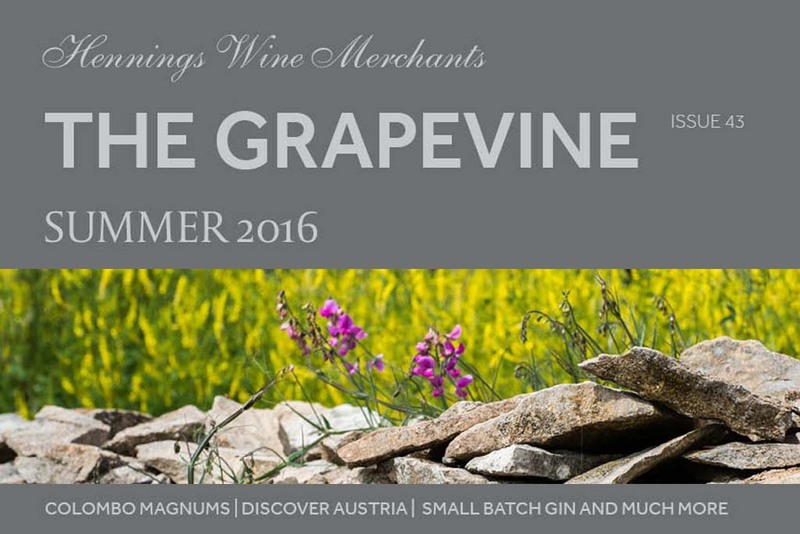 They’re good fun and a great opportunity to taste new vintages of wines we already sell. The ‘body’ events can be massive. These are organised by a particular trade body or collective along a theme, so Wines of Australia, Wines of Argentina, The BFT (Big Fortified Tasting) etc. They can be massive affairs that are often pretty daunting – the recent Wines of Australia tasting featured over 1,000 wines from 245 wineries on 80 tables. The second, much more civilised option is to taste at our HQ. We’ll gather samples from new importers, unrepresented vineyards and wines we’ve found at tastings before our ninja tasting team and crack through them. I would say this is a much softer paced affair than the big external tastings but in reality it’s still pretty full on. Two days into the week and we tasted 40 wines last night (highlights below), have another 72 tonight and the rest of the week is looking pretty stacked. We’ve had a bit of a fag-packet wine tasting calculation in the office and reckon we’ll taste around 2,500-3,000 wines between us by the end of February. I think next year I’ll make a note to keep an eye on numbers so I can bring you the exact number, it might also be worth mentioning it to my doctor. For us there’s not a ‘one size fits all’ when it comes to choosing new wines so when we taste we have to think about how the wine will fit into the existing range and what part of our business it’s for. Will the wine be for wholesale or retail, website or agency, special parcel or new continual line? The wine tastings can be a mixed bag and you can quite easily taste 50 wines and only think one or two are worth pursuing. Other times, like last night, you can taste 40 and love 15 of them – it’s all about tasting as much breadth as possible so we can find wines you’ll love. Last night’s tasting, with one eye on our spring Grapevine, had a range of wines from Argentina, Australia, Burgundy and a few thrown in from New Zealand and Chile. It was a joyously stimulating selection that is sure to appear over the coming months; we know you’ll love them so watch this space. 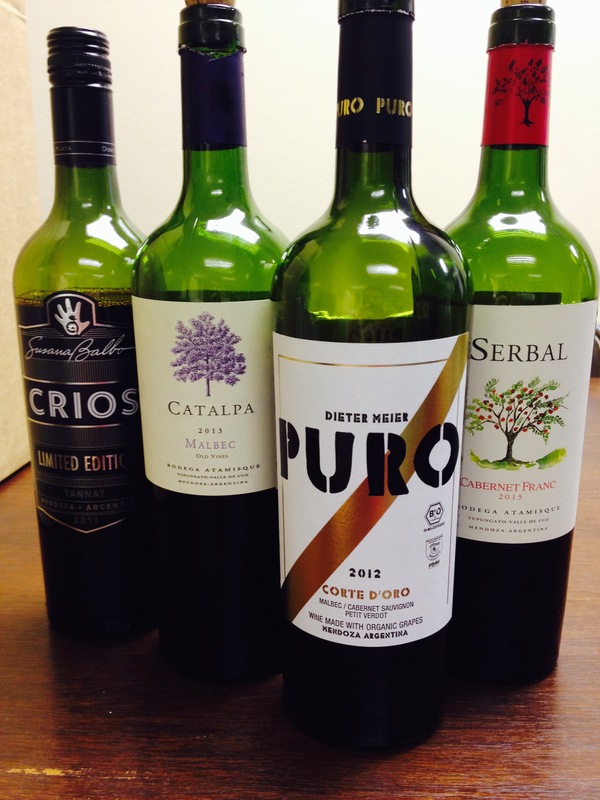 Puro Corte d’Oro 2012 – an amazing Malbec, Cabernet Sauvignon and Petit Verdot blend from Mendoza. Made by an acclaimed Argentinian winemaker who also plies his trade in Pomerol it’s sumptuous and so classy. A likely special parcel of 20 dozen – should be about £18 (normal price £25). I’m in love with the packaging too. Serbal Cabernet Franc 2015 – sometimes you come across a winery and winemaker at a wine tasting that can do no wrong. Atamisque is a perfect example of this. They make 13 wines and they’re all brilliant. This is from their Serbal range (all unoaked) and has amazing bell pepper and pencil shaving notes. It has loads of red berry fruit and top-notch freshness – great to see these ‘new’ varieties performing so strongly. 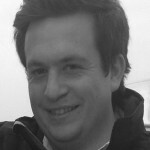 Catalpa Malbec 2013 – Philippe Caraguel from Atamisque can do no wrong for me. Malbec of this quality is hard to find and for sub-£15 it’s crazy. There’s layer upon layer of classic sweet Malbec fruit and subtle French oak (50% of the wine) with a resonating freshness. When this hits I’d be stocking up for summer and beyond. Take a bow Philippe. Well, thank goodness that’s over. 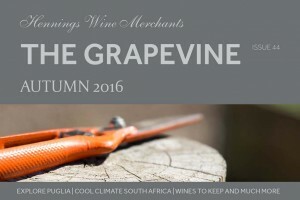 There’s nothing I like more than moving into winter and the opportunity to wrap up and drink some richer wines. 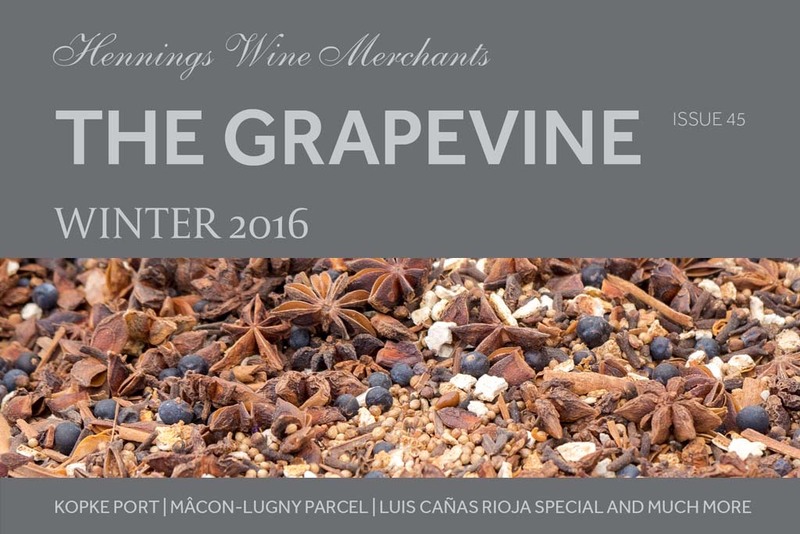 The team here have been hard at work compiling our festive favourites into The Grapevine 41 for your vinous pleasure over the next couple of months and think we’ve cracked it. Obviously, with over 1,000 products we’ve got masses more available both online and in our shops so if there’s something else you’re after then peruse via your preferred method – I’m certain you’ll find it. All at Hennings would like to wish you well for the coming festive period and take the opportunity to thank you all for continuing to support the independent – we couldn’t do it without you. Summer certainly had its ups and downs with regard to the weather. 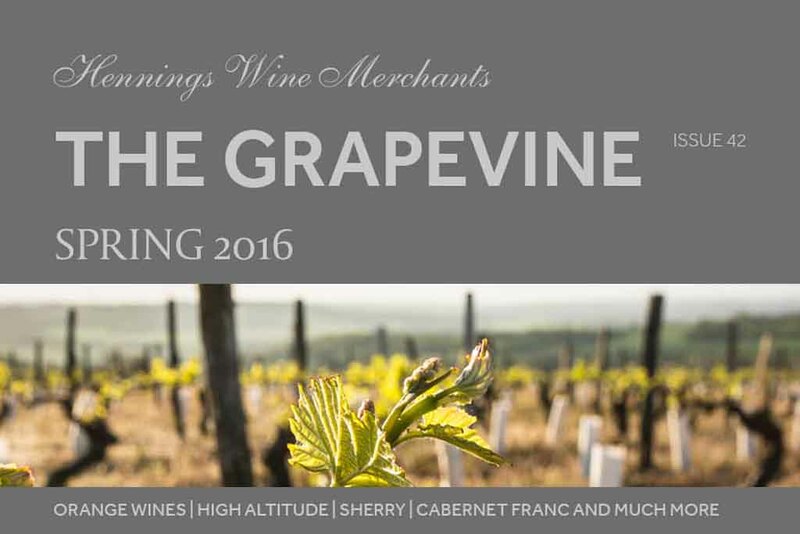 On the whole it did offer a brilliant opportunity to enjoy the refreshing whites and spicy Provence Rosé wines of our last Grapevine in their preferred environment! As I stare out of my window Autumn, seemingly, is upon us so it’s time to revel in some fuller reds and richer whites. We’ve got some new and exciting Italian wines including some rustic reds and a delicious new Prosecco among a plethora of fuller and richer wines – the Cien Y Pico and Aragonia Garnacha are my picks. 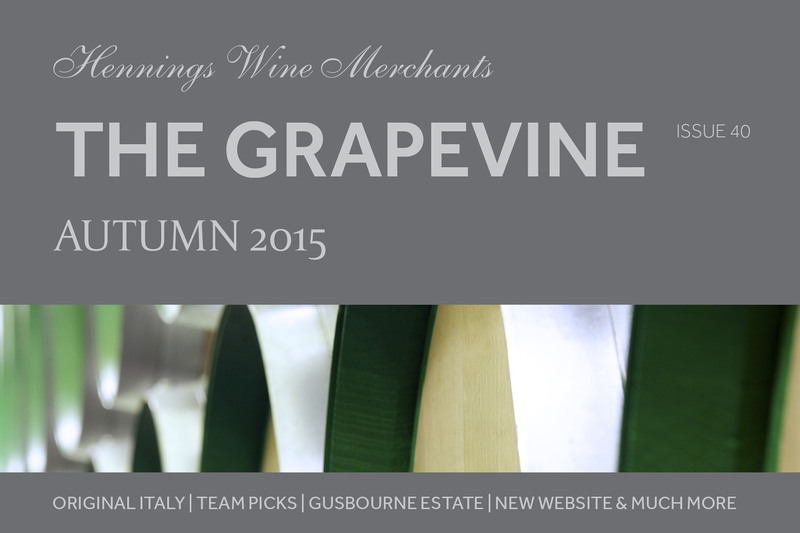 Order some wine from The Grapevine 40, put the heating on, sit down and pop your feet up – silly season is almost here. Indigenous grape varieties such as Fernão Pires and Touriga Nacional sit happily alongside international varieties such as Sauvignon Blanc and Pinot Noir at Quinta de SantAna. On a recent trip to Portugal I found myself negotiating hair pin turns on a mission to seek out the hidden gem that is Quinta de SantAna. Nestled in the hills some 35km or so North of Lisbon I found myself rounding the final corner and being greeted by the unmistakably yellow estate. For James Frost and his wife Ann, this place signifies so much more than a home for themselves and their seven sons. Ann’s side of the family, the Von Fürstenburgs, owned and lived at the predominantly arable estate until the revolution in 1974 when the family returned to Germany and the gates were closed. A family friend ensured that the estate didn’t become completely derelict and in time the farm was handed down to Ann and her husband James, an Englishman from Dorset. They then set about not only turning the estate into the most beautiful setting for weddings, parties and holiday accommodation but also painstakingly re-instating its vineyard. James’ background is that of farming and with the help of his winemaker has certainly played to his strengths developing the vineyard and ensuring that quality, not quantity, is the key. Indigenous grape varieties such as Fernão Pires and Touriga Nacional sit happily alongside international varieties such as Sauvignon Blanc and Pinot Noir. The estate is heavily influenced by the Atlantic and as a result the whites are crisp and the reds fresh and full of character. The winery is small yet perfectly formed with two lagares (granite troughs) where the grapes are still trodden in the traditional way. These are surrounded by the more modern vats and stainless steel tanks. 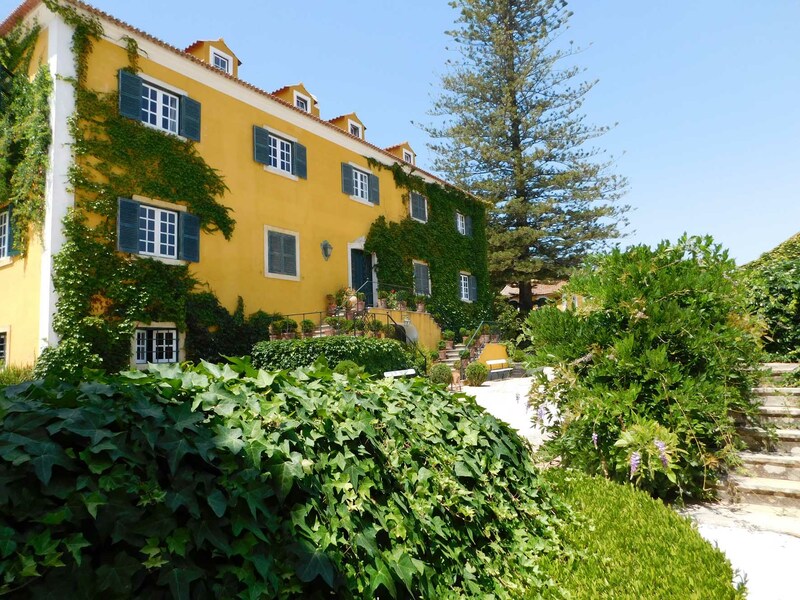 The combination of the traditional and modern can be found throughout Quinta de SantAna. Nods to the history of the Quinta being found everywhere including the name of their top wine – Baron Von Fürstenburg. The variety and quality of Portuguese wine has come on in leaps and bounds recently and as is often the case in relatively underrated areas of the wine world there are some real bargains to be had. We think that these wines offer real value and are well worth your attention. Saúde! Taste all of the Quinta’s wines at our tutored tasting at the end of November.